Reasons to Run: There goes the neighbourhood… | We RUN Tings! According to the news media, I live in a “high risk” neighbourhood. You know, fraught with violence. Gangsters hanging out and selling crack (or whatever drug of the moment) on every street corner. Drive-bys and carjacking every night. Residents hiding behind closed doors and curtains in fear for their lives. The supposed status quo in this and the 12 other “priority neighbourhoods” spread across Toronto. Politicians (in government buildings far away from here) continue to debate about what to do for us or about us. Blame it on the endorphins, but I just don’t see it. When I’m out for a run, early in the morning, or on a sunny afternoon, I am motivated by our beautiful parks, trees, shrubs and wildlife (birds and squirrels, that is). It gives me such a feeling of connection when I throw a cheerful “Good morning!” at different people in my community, walking to school, standing at the bus stop, or even out for a run themselves. Our neighbourhood is one of the most diverse in the City, and you can see that reflected in the people jogging at all times of day. I think seeing people run is uplifting — like the people in our community have the time and the means and the desire to focus on staying healthy, on bettering self and ultimately, family. 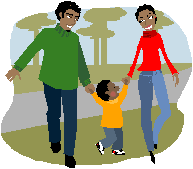 Healthy families are the backbone of healthy communities. AND when we’re walking and jogging on those streets, pathways and parks, we can also see when they need to be fixed. Or cleaned. Or whatever. And we can call our City officials and remind them to get the job done. I’m just saying. Connect and protect. Talking to our neighbours helps to make us safer too. We start off just saying hi. Then people start to look out for us. They notice when we are not there. We can start making further conversation: “Hey, I didn’t see you running by here last week. Oh, you went on vacation. How was it?” That’s basic community-building right there. The benefits go further because we are getting physically healthy too. And getting out there can motivate others to do the same. When we see runners who look like us, it challenges our views. It makes us say “Well, maybe I can get out there…” My neighbourhood is over 85% “visible minorities”. Believe me, this not just a young, white, middle-class thing. We are out there. I see it every day. So I say all that to say, it’s not that we don’t need better social supports in our neighbourhood. Let the politicians do what we’re paying them for. But WE can better our communities NOW doing something that does not require any long meetings, panel discussions, debates, red tape, special permissions, a sit-in, or a letter-writing campaign. For a safer and healthier community, vote with your feet. Just make sure you put some comfortable shoes on first. Was great seeing you at the TYS10K expo. I managed to run it in 1:03 mins. Very proud of myself especially considering I have been doing very little training. I will be doing another 10k this weekend in Unionville. This one will certainly be more challenging as it’s not as downhill as Yonge St. If you have running groups that you organize let me know as I wouldn’t mind joining.